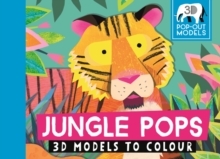 Beautifully illustrated by emerging talent Natasha Durley, children can bring the jungle to life with this collection of beautiful press-out animal models to create. Colouring them in is a fun extra!Each simple design is reversible, with a fully coloured animal on one side. From a mighty lion to a striking tiger, and a characterful orangutan to a colourful giraffe, there's a whole host of characters to discover.